One thing I am not too fond of and will run from is sales. At my previous job, I would cringe when they would say, “it’s your turn to walk the floor and sell credit “. That means I have to convince customers that this extremely high interest rate card was a good thing for them. I hated it! I would put on my sweet, innocent face with a third grade smile and say “sir would you like to sign up for our advantage credit card today? If you do you will receive 10% back on your purchases.” and the customer in a rude, irritated tone would say “NO”. After a 100 NO’s a girl couldn’t help but think I was the problem . With that being said, you could only imagine how I felt when they announced at my church, “We’re selling candy to raise money for our youth trip” . “NOOOOO, I am not selling candy! I’m not a good salesperson”, I thought. Little did I know that through selling candy God was getting ready to teach me a little lesson. We scheduled Good Friday afternoon to sell candy in front of a neighborhood store and I was partnered with some of the kids from the youth department and my sister. At first I was little hesitate to ask anyone if they would support the church group . I didn’t feel comfortable with asking people I did not know if they would indulge and buy a little sweet moment of chocolate bliss. It was like I had built up in my mind that the moment I would ask they would bite my head off . However the small kids were asking in their sweet voice each customer if they would like to buy candy to support their trip. They got a few No’s and that didn’t bother them they just asked the next person and then the next person . None of it was taken personal. Then it hit me” You are going to be rejected more than one time but it shouldn’t stop you from asking. You just keep moving.” The Holy Spirit referred me to Samuel( 1Samuel 8: 7) when he thought Israel was rejecting him because they wanted a king. 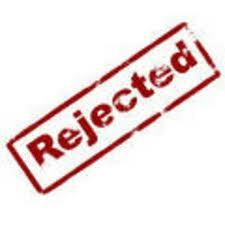 God said it’s not you that they are rejecting it is me. In other words don’t take it personal.